Three Thing Game is done and we came out with a pretty good game. We didn’t win but we did get into the top 8, which out of about 40 teams is damn good I think. The other games in the top 3 were all very good, especially Sheerware’s Hyper Morph which I loved playing and hope to see soon on the Windows Phone store (hopefully with the option to not have adverts hint). In this post I’ll walk you through the week and the 24h dev session at the end. There are a lot of pictures so click through to the blog post to see the rest if your on the front page. Our three things were ‘fighting, toast, party’. Even before we got them Nick had an idea for a Geometry Wars style space shooter for Windows Phone 7. I liked the idea and along with Danny we tried to get words to fit the style of game we wanted. We unfortunately lost the word Atomic to another team and there were no space related words coming up in the draw so eventually all our words were random. 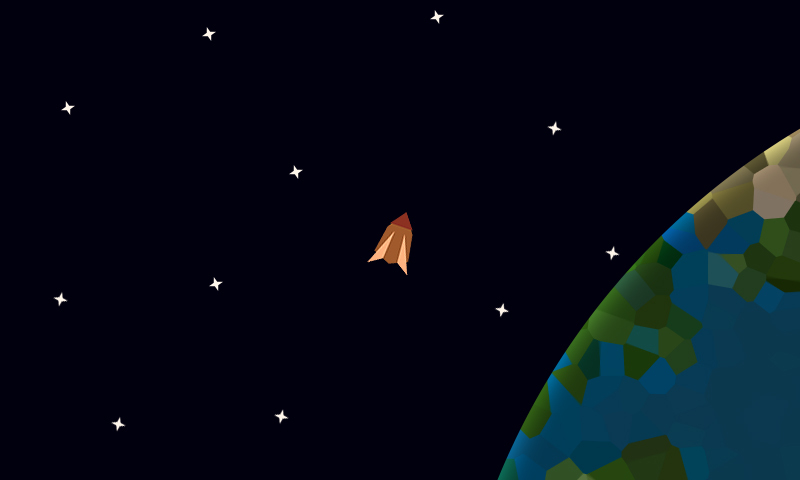 We still wanted to do a space shooter game so we worked the words into the game. 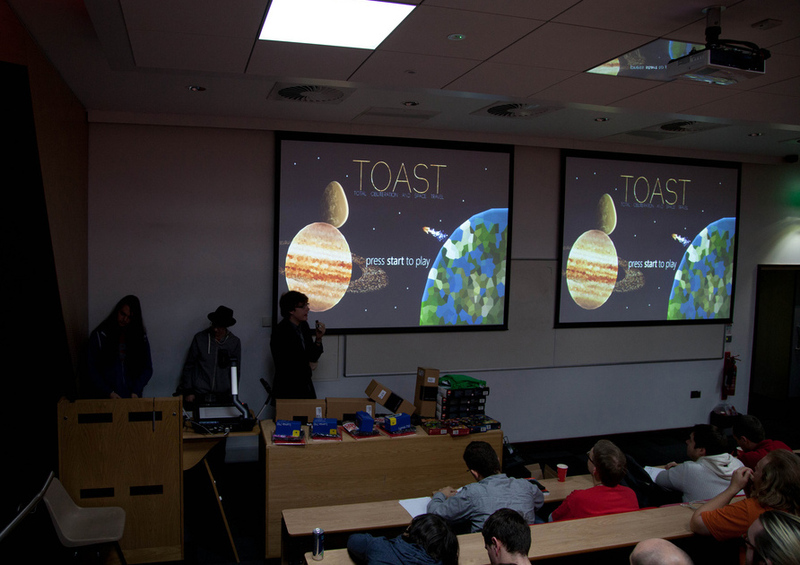 Danny came up with the idea to have toast be an acronym for ‘Total Obliteration And Space Travel’ which worked perfectly. The final game used the acronym as the title. 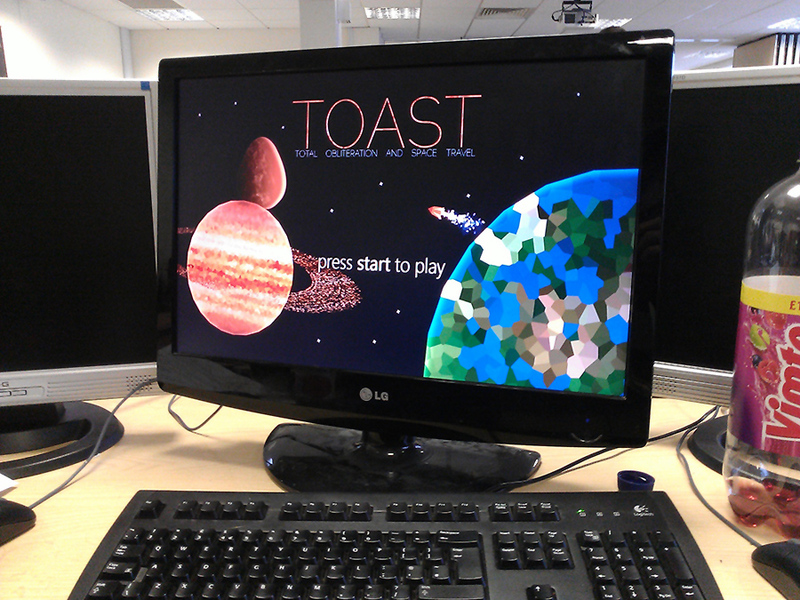 TOAST, a free-roaming space shooter where you play as a race of toast people called the Toastorians. Your mission is to fly around space destroying the other breakfast food related races of Baconites, Egg Men, Porridgeans and Cerealians. The game world is randomly generated each time you play, making it a new experience every time. While at the three thing auction I thought of the Windows 8 beta fish and decided that it was a really cool basis for an art style for the game. I was thinking of using simple shapes and block colours and no outlines. This was quite a departure from last years Granddad Invasion which used more realistic shapes, textures and every object was outlined in black. After discussing it for a while at Uni and again at home I came up with the above image that summarized what I thought the game should look like, the colour scheme and feel. Nick and Danny liked it and we agreed on using the art style. The game progressed over the week and the weekend including loads of code and over 30 art assets made for the final game. During the week we decided to change platform from Windows Phone 7 to PC. We decided that the game played a lot better as a twin stick shooter using an Xbox controller. The added screen space and resolution added a lot to the immersion of the game and we also had a lot more power of modern PCs to play with. I also had the idea of making the game open-world and free-roaming with every planet in one space instead of in separate levels. It added more to do in the huge play space that Nick had created, and made discovery more interesting. It also meant the enemy races could fight each other adding to the ‘political party’ element of the game. There were a few disagreements on how the game should work. For example, Nick wanted to randomly generate stars in the game which would mean they would never be in the same place twice but would also mean there would be tens of thousands of star objects being drawn at once, each with their own x y coordinates and variables. I thought this was a massive waste of computer resources and argued the matter. I wanted to create a large texture that would have randomly generated stars done one-off then tile the image over the game background, thus reducing the object count from tens of thousands to just tens. In the end we went with Nicks system because he was the one writing the code. It actually performed well on PC, however I don’t believe the system would fair as well on a portable device. 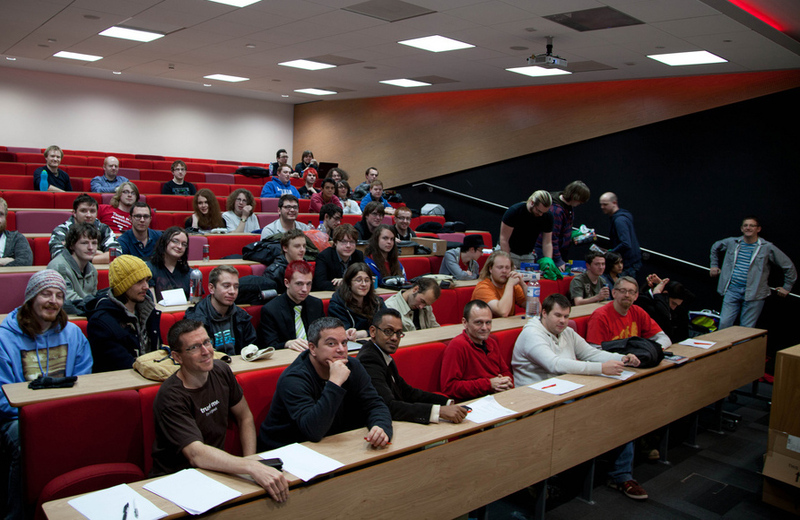 Later after the competition, housemate Hayley suggested the stars be randomly generated in-engine then written to a bitmap image which would be drawn in-game. This would be a good solution as the star positions would always be random but the game would benefit from only having to draw one texture or a few tiled. The weekend went well. SVN worked great for Nick and I, Danny had a few problems but it was a fantastic tool for sub-versioning overall. I went home at half 2 and came back at 6am having about 3 hours of sleep. Some may call this wimping out but it was invaluable for me. I made it all the way to midnight of Sunday then had 10 hours sleep through to Monday so my sleep pattern wasn’t affected and I feel fine now. Definitely the right thing to do if you can’t handle sleep deprivation. 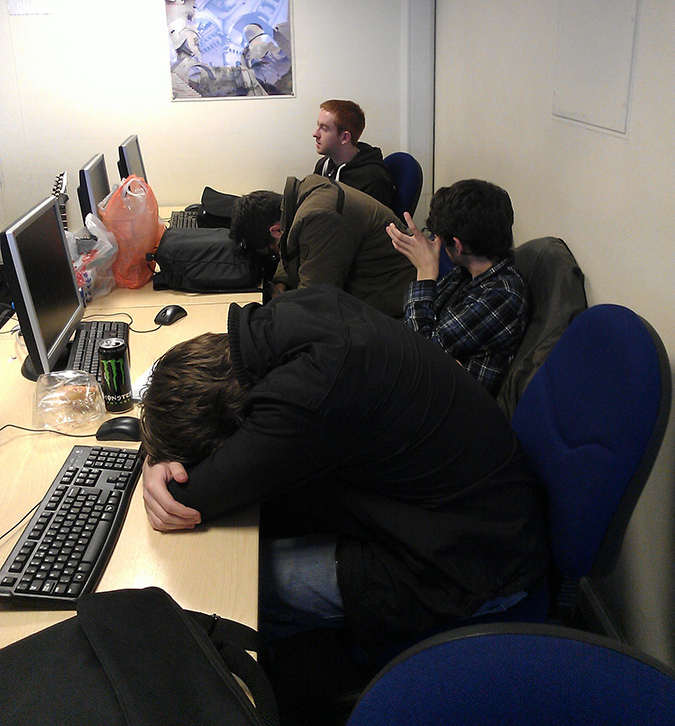 Tiredness gets to everyone by the end. The game showing was good, it was great to see other people’s creations. 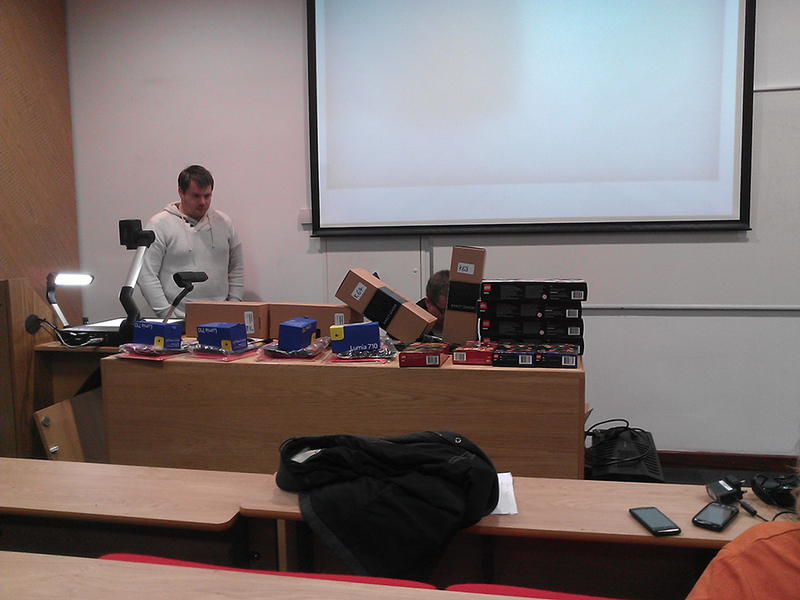 The prizes for 1st, 2nd and 3rd were good too, they included WP7 phones, Xbox Kinects and lego. 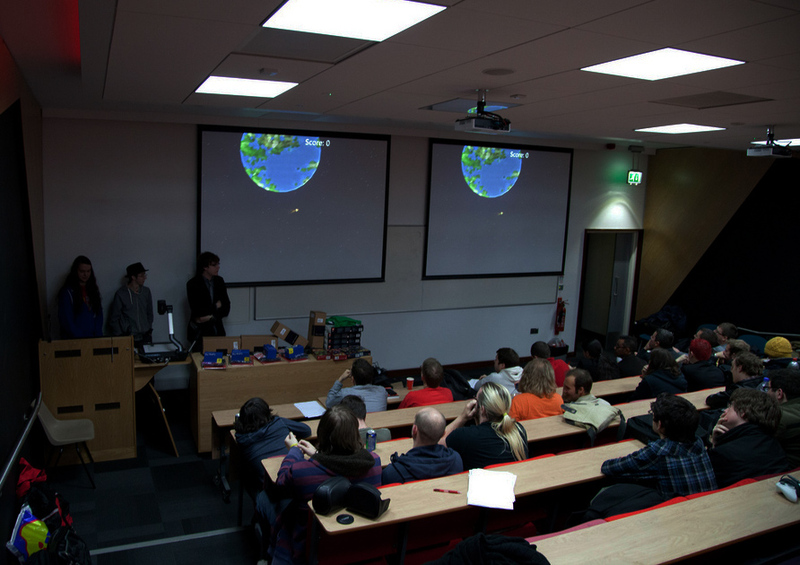 Here we are presenting the game. We also answered questions from the judges. The teams who got to the finals and the ones who made it to the end of the night. The judges were in the first row. Overall then, I really enjoyed the competition and am glad I took part, even if we didn’t win we still were miles better than last year. I’m not sure what will happen to TOAST, I think we are planning to port it to the Windows 8 store or release it stand-alone. There were still some things we didn’t have time to implement, such as more advanced AI and some of the enemy races. That’s all for now.